1 Peter 2:1-2: "Therefore, laying aside all malice, all deceit, hypocrisy, envy, and all evil speaking, as newborn babes, desire the pure milk of the word, that you may grow thereby." You will notice that this second part of the passage begins with a reference to putting things away: “Therefore, laying aside….” (v. 1). Before we can put on a life of godliness we have to get rid of a life of ungodliness. 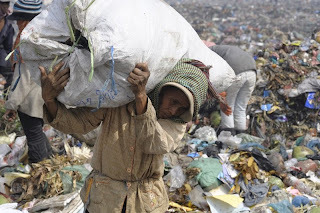 Picture a man walking along, and he is carrying piles of garbage in his arms. I mean he has heaped up in his arms old newspapers, and tin cans, and used tissue paper, potato peelings, and banana peels. And as he walks along balancing all this garbage, he sees on the ground a pile of precious stones. Rubies, diamonds, sapphires. And he meets a kind looking man who says, “You can pick up and take with you anything that you find there before you.” The man tries to reach for the gems, but as he does the trash shifts, a few items drop which he quickly grabs and piles back onto the putrid top. The burdened man in exasperation finally says, “I really want to pick those precious stones up but can’t you see that right now my hands are filled to the brim with these things?” Then the wise and kind man says to him, “Friend, put down that garbage and leave it by the wayside and gather up this treasure that is being freely given to you.” Don’t you know that this is what Christ says to every garbage toting sinner whose path he crosses!